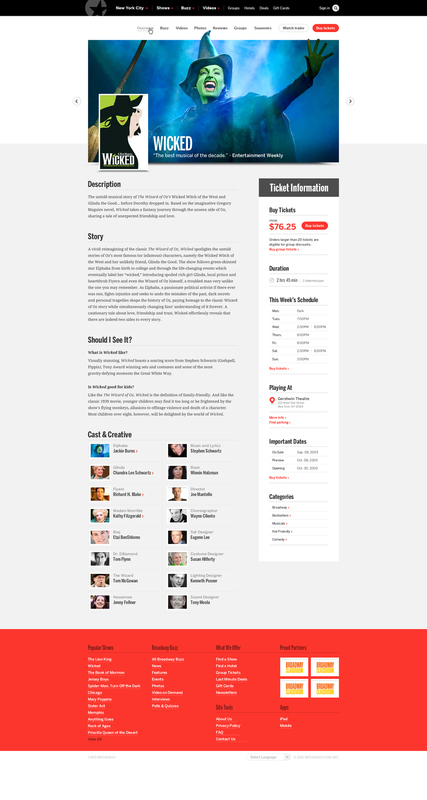 One of the first projects I was assigned to at Fi was an exploratory stab at redesigning Broadway.com. Hot on the heels of the Broadway.com iPad App release, I was tasked with applying the style created by my friend and mentor Brijan Powell to a fresh re-skin of Broadway.com's existing site. The redesign consisted of three pages — the homepage, a browse-focused page of shows and musicals, and a detailed page with information about the cast, showtimes, and tickets — each page requiring special attention to advertising and promotional needs.